Massima Piras, Charter Marketing Agent at Fraser Yachts, sends news that the 60.1m Feadship motor yacht Paraffin has a great secured berth at St Barths and is still available for holiday charters. 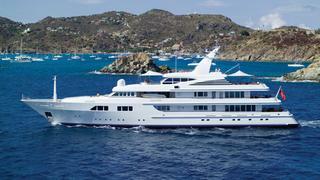 Designed by De Voogt Naval Architects and built to Lloyds class she has those classic, timeless Feadship lines. MCA compliant, Paraffin accommodates 12 guests in six staterooms including a full beam owner’s suite forward on the main deck. During her refit in 2010 zero speed stabilisers were added for ultimate comfort. Guests can enjoy a fully equipped gym and there's an impressive array of toys including an inflatable water slide. Charter rates on Paraffin are $410,000 in high season and $360,000 in low season.